The immigration debate has been hijacked by those who claim to want a dispassionate treatment of the issue, but in reality have a distinct, fixed view. That’s why my heart sinks with each new Migration Watch report. Like the Taxpayers’ Alliance it seems like an organisation which uses a legitimate issue of concern as a Trojan Horse for a particular political view. The recognition that immigration is indeed a complex issue was a rare and welcome admission by the Government. But there was, of course, nothing innocuous about the timing of the MW report, playing as it does to the defining issue of the EU referendum debate. Migration into the UK is part of our past, present and future. In a global economy and with an imperial past how can it be any different? Richard Bean’s 2009 play “England People Very Nice” showed (controversially ) how successive waves of immigration have been assimilated into society, changing it along the way. But as the Financial Times’s George Parker observed in an excellent article: “Immigration has become a metaphor for everything that is wrong with the country. A stick to beat politicians who break their promises, rather than necessarily a big factor in their daily lives”. Those “big factors” are the things that are making our country so ill-at-ease with itself. As I said recently, many – very many – people in our country have urgent pressing issues that need sorting out immediately if not sooner. Few decent jobs, even less social or affordable housing, well established industries changed beyond recognition (from privatization of Royal Mail to the strangulation of the UK fishing sector), the uncertainty brought about by changes (either real or anticipated) in population. It is entirely understandable that this instability generates fear – the fear of limited resources and opportunities being even more thinly spread, which then gets transformed into a fear and hostility of strangers. It is wrong to dismiss these as unimportant or imagined, but equally flawed to dress it up as something that it is not. It is an old trick – turn immigration into the lightning rod of discontent. It plays on deep–seated anxieties and always ends badly. 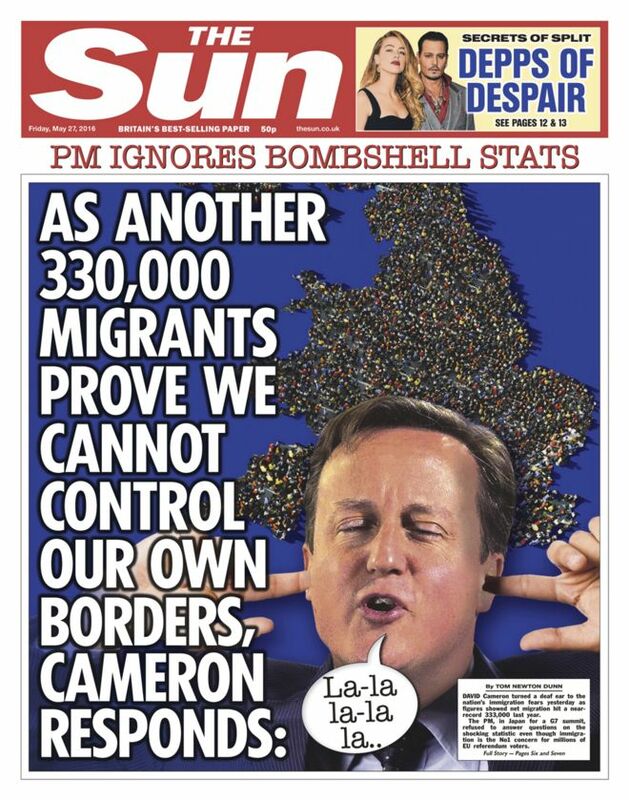 And that’s the problem with the Migration Watch report and newspaper coverage like the Sun’s 27 May front page showing a Britain over-run with “migrants”. These are not neutral acts (as perhaps Andrew Green would claim), and cannot honestly be held to encourage sensible debates on delicate issues. Time will tell if we have really entered a new era. I hope we have. But until I see Parker’s article reprinted or reflected in the Mail or Express and Boris Johnson calling out the toxic and xenophobic of his co-Brexiters, judgement is necessarily reserved.